The Pastoral Institute offers formal courses on the Catechism of the Catholic Church, the Bible, Theology, Philosophy and Catholic Culture, to form Catholics in the faith and prepare them for some type of ecclesial service or ministry. For those that teach or want to teach the faith to other adults and prepare them for the New Evangelization, the Pastoral Institute offers a gradual Formation/Certification Plan that promotes ongoing faith formation. The Department of Adult Faith Formation & Pastoral Institute requires certification of all lay people who teach the faith to other adults within our parishes and missions. 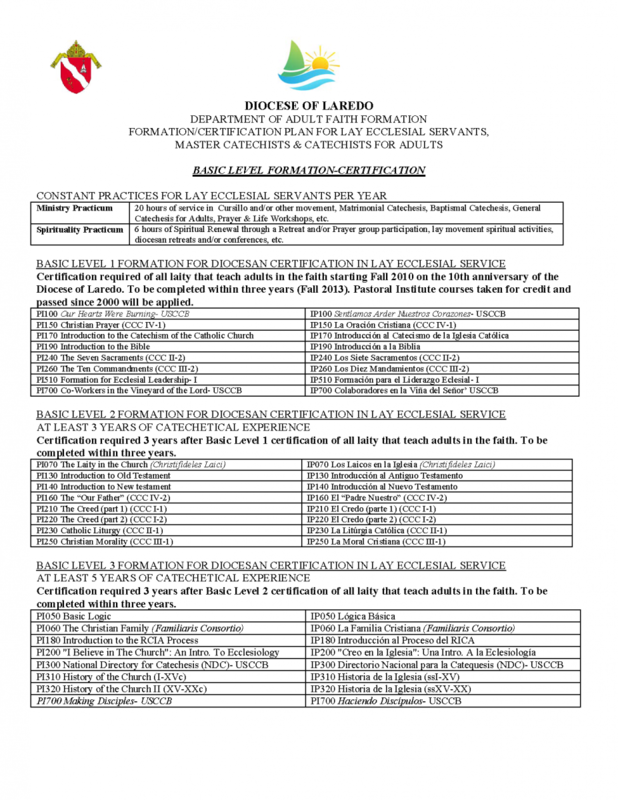 Certification is a requirement of all Lay Ecclesial Servants in the Diocese of Laredo, starting with the Basic Level 1 Certification. This iniciative to certify lay "ministers" or ecclesial servants in our Catholic Church is also a trend at the national level inspired by the US Conference of Catholic Bishops (USCCB: "Co-Workers in the Vineyard of the Lord") and promoted through the Alliance for the Certification of Lay Ecclesial Ministers. The Pastoral Institute of the Diocese of Laredo is member of the national Federation of Pastoral Institutes. The Diocese of Laredo Pastoral Institute was represented through FIP at the 2011 Collegeville National Symposium on Lay Eccleisal Ministry (St. Johns' University, Collegeville, MN Aug. 2-5, 2011). There are many opportunities available to engage catechists and Catechetical Leaders in on-going formation. This is a critical task in order to insure that we are able to bring the message to others while also deepening our own understanding of the faith and teachings of the Church. Note: The following are non-diocesan training programs. The Oblate School of Theology is a Catholic graduate, professional and seminary school that provides education in Catholic theology for the church’s mission and ministry in the world. An avenue to bring together different cultures, Oblate empowers through education. The Franciscan University’s Distance Learning Program brings educational resources to the thousands of people who desire to learn more about God and His Church, but who cannot come to the campus in Steubenville, OH. The yearly conference offers Catholics an opportunity to receive exceptional faith formation from nationally recognized speakers who will address relevant topics of faith, catechesis, education, theology, prayer and ministry. Participants will attend keynote addresses and ministry-specific breakout sessions, participate in Mass and prayer services, visit the exhibitions, admire the liturgical art display, and listen to Christian musical performances. Offers carefully designed undergraduate and graduate programs as well as graduate certificates and Continuing education programs to help students acquire a deeper appreciation for the wisdom and beauty of Catholic tradition while developing the pastoral skills necessary for effective ministry.